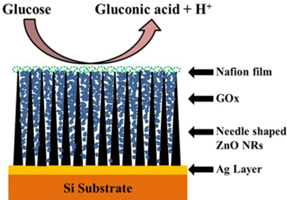 Zinc oxide nanoneedles (ZnO NNs) were grown directly on Si/Ag electrode in solution at 90 °C and used to fabricate an enzyme-based glucose biosensor through immobilizing glucose oxidase (GOx). The present ZnO NNs based biosensor exhibits a reproducible sensitivity of 81.71 µA/mMcm2 at an applied potential of +0.58 V with a detection limit of 3 µM (S/N=3), wide linear range 0.01-31.5 mM, response time ~2 s and the Michaelis-Menten constant (KMapp) is calculated to be 0.0137 mM. Moreover, the anti-interference ability and long-term stability of the biosensor were also assessed. These results are well-consistent with the fact that more GOx is immobilized on ZnO NNs, which have higher specific surface area and provide direct electron communication path between the enzyme’s active sites and the electrode.